Also, I wanted to answer a comment by Katie on another post. She asked if I used any special tricks when I photograph my projects. The answer is no, not really. I used a Nikon D40 camera. I photograph my projects sitting on chair covered with a white sheet in front of a large picture window that gets pretty good indirect sunlight. I do not use a flash. And I guess if there is any real "trick", I edit all of my photos in Photoshop. Usually all it takes is adjusting the brightness and contrast, and then cropping the photo. So, there you have it. Nothing too special. But I hope it helps. 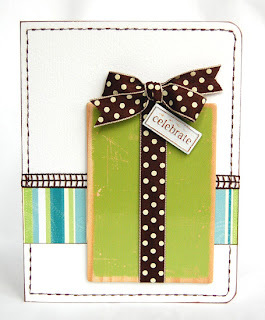 I did recently see a cool link to a blog that showed you how to make your own lightbox. I really need to try that. I will find the link and add it to my next post. Well, it is late and I need to get up early to get the kids off to school in the morning. Thanks for stopping by! Guess what we did today? It actually snowed here today. We were all so excited, and we spent the morning playing in the snow. Now, it wasn't much (we are in Alabama, ya know. ;) ), but we made the most of it. Nothing beats playing in the snow with your family. So, so, so much fun!!! While I am here, I may as well show you my Provo Craft projects for this month. We had a freebie month and got to make whatever we wanted. I decided to get in the holiday spirit, and I created something for each of the upcoming holiday: Valentine's Day, St. Patrick's Day, and Easter. 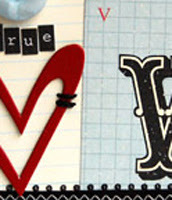 First is a Valentine's card. 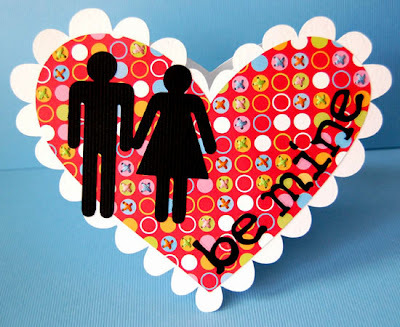 For this one, I used my Cricut, Doodlecharms cartridge for the hearts, Going Places cartridge for the couple, used a little bit of Rob&Bob paper, some PC Alphabiggies stickers, and did a bunch of hand stitching. 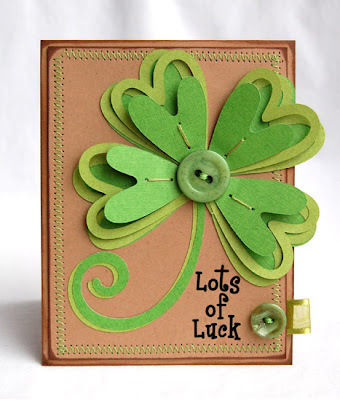 The next is a St. Patricks Day card. 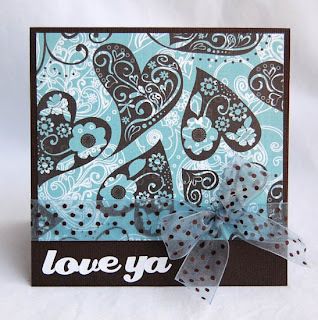 I used my Cricut, Accent Essentials cartridge for the heart shapes and flourish, and some PC rub-ons. 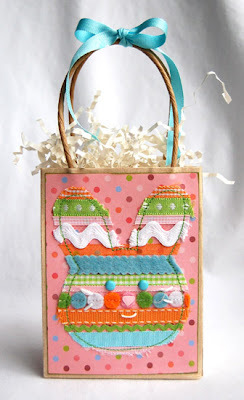 Lastly is little Easter gift bag. For this one, I cut out the bunny shape with my Cricut machine and Doodlecharms cartridge. I used a repositionable adhesive to attach the ribbon to the Rob&Bob paper. 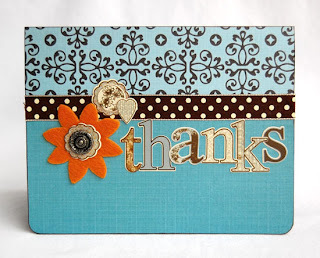 Then, I adhered the die-cut negative to the card, and used the outline to sew around my shape. When I was done, I cut the excess ribbon and used a gum eraser to remove the repositionable adhesive. I added some brads for the eyes, a die-cut for the nose, and some stitching for the mouth and whiskers. Then adhered the paper to the bag. Voila! Cute ribbon bunny! Well, that is it for me tonight. I am worn out from playing in the snow. 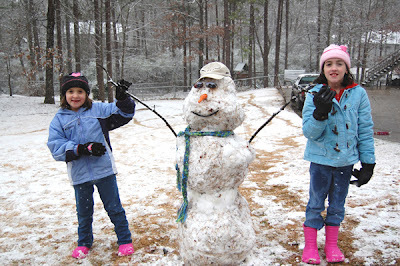 (Btw, it is already gone, except for the snowman. :( ) Thanks for stopping by! at this blogging thing. When I first started, it seems like I was posting once or twice a week. Now I'm lucky if I do it once a month. I need to make a resolution ( a little late, huh? ) to blog more often. I love to share my work, so it shouldn't be too hard to keep, should it? I have some things to share, so I will just get to it. Here are a couple of cards that I made recently for Magistical Memories. 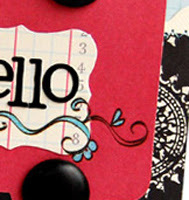 The first is just a little Hello card using the Circle Border Solid chipboard. 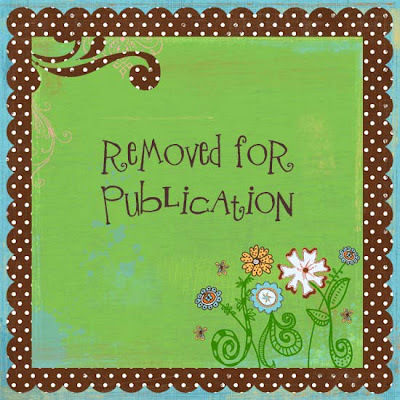 It comes as a 12" long border, but it is very easy to cut down and use on a smaller project. I also have some projects to share that I made using Self-Addressed's December kit. 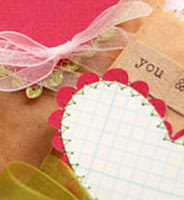 I love the colors and patterns in the Chatterbox papers and all of the fun goodies in the kit and Dress It Up addition. Make sure to check out the rest of the Design Teams ideas when you head over there. Just pure eye candy, I tell ya! The January kit is out now too. We get to work with Collage Press products, and let me just tell you that these papers are beautiful. You should definitely check out this kit. Well, that is it for me today. Thanks for stopping by!